A charming and irresistible independent and typical stone house, perfectly renovated, preserving tradition, located in Loveno, on Menaggio’s hills, just 1.5 km from the lake. A quiet and private position, with a little garden and a marvellous terrace overlooking the lake and the wood, where you can enjoy romantic dinners and lazy days in the sun. Come here to forget about the rest of the world! Relax and discover the beauty of Lake Como and its mountains. If you like to walk and hike, from the house you can start different trails, from easy to difficult. In the centre of Menaggio, that you can easily reach with a short drive or a 15-20 minutes walk, you can find all the facilities you need: shops, supermarkets, restaurants, coffee bars, internet points, banks, post office, public beach with swimming pool, lake promenade, ferry boat, bus station and many others. And if you need to connect with the rest of the world, use our free wi-fi internet. Bathroom with toilet, sink and large shower. Living room with sofa, satellite TV, dining table with chairs, access to the large terrace with romantic lake view. 2 coffee machine available at the cottage: one for the typical "moka" italian coffee and one for american coffee. Kitchen: induction hob, fridge, freezer, microwave, cooking utensils/pots/pans, cutlery, plates, glasses and wine glasses. Many beautiful ski resorts in the Alps, both in Italy and Switzerland, are reachable from one to two hours drive. The famous, second oldest Golf Club (1906) of Italy is located just 5 minutes drive away from the apartment. Notes on accommodation: Parking: available just outside the house. The last 200 metres to reach the house are on a small road, with a couple of difficult curves: you need to be a bit experienced. If you prefer it is also possible to leave the car in another parking space, 200 metres from the house. Outside: South facing large terrace with garden furniture (table with chairs), allowing you to dine as the Italians do, 'alfresco'. Also available 2 sun beds to relax in the sun. Cleaning / Towels / Linen / Maid service: Linens and bath towels provided. The apartment is cleaned with each guest change (charged separately). Other: Extra large room (tavern) equipped with washing machine. Best of both worlds...mountain walking in stunning scenery....alfresco dining at the Lakeshore. Debrohah ensured our stay was perfect. Thank you Stephen! I'm very happy you have enjoyed our cottage and what "our" lake offers. I hope to see you again! Deborah was a delight to deal with, accommodating and quick to respond. Cottage quite a challenging walk uphill from Menaggio along steep narrow winding lanes. We were pleased we had hired a car despite doing the uphill walk on the odd occasion. It is easy to walk down and you could get a taxi back up. There is free parking down at the lake towards the lido which we used daily. What everyone else said! It's a lovely house, nicely decorated and clean. It's in a good location especially if you like walking as there is a 'starting point' for many trails nearby. People mentioned the steep road to the cottage; it is steep and narrow, but to give a sense of proportion we managed to get a Mercedes E class up it, but had to do a '3 point turn' on one bend and there was not much room either side. As a large 50 year old I also needed a couple of stops on the walk back from Menaggio itself but there are seats all along the way and a water fountain in one small square so it was fine and I did it 4 times in the week. I'd say it took 25 mins to walk down, and 45 up with stops, but I'm overweight and unfit. Deborah was very helpful, pleasant and speaks really good English. If like me you Google Earth destinations, there is now a house being built in the field next door by Deborah, but it is not overlooking the property and you still feel peaceful and away from it all. We will be back in a couple of years when we're ready to return to the area. The views were stunning, garden pretty and facilities just what you need for a holiday for two. We had a superb week in Italy by Lake Como. The cottage is as described and the owner, Deborah, is extremely helpful. I'd never booked through the internet before and the fact I was planning twelve days abroad made it all a bit daunting but everything went smoothly. 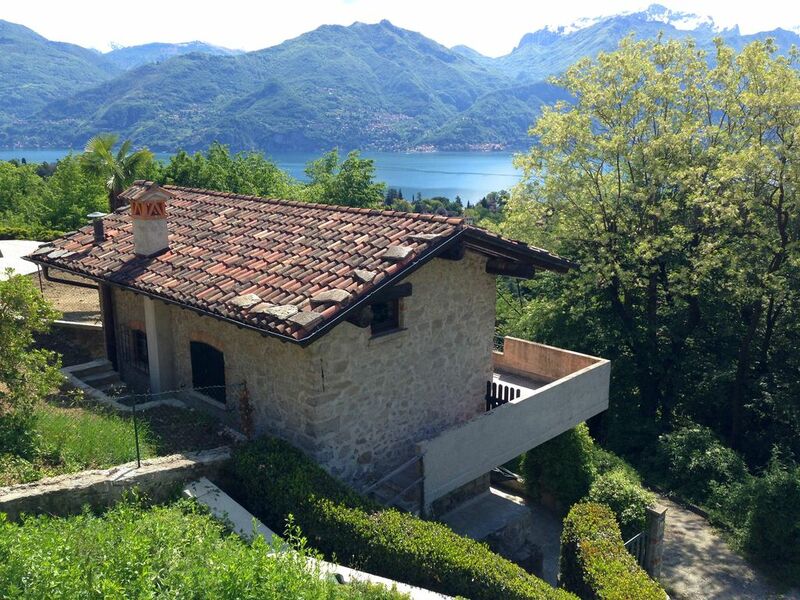 Lago di Como itself is gorgeous, and the cottage is situated in Loveno above Menaggio. We walked every day down into Menaggio (it is steep but the views are worth it) and we found lots to do: hiking in the hills (the Refugio at Monte di Braglia is particularly recommended); ferry trip over to Varenna and Bellagio; just wandering around Menaggio (there's an historic walk that's worthwhile); and painting - the scenery is picture postcard worthy. There is a local trattoria just a few minutes from the cottage - Vecchia Magnolia - that does good food, and everybody is friendly. We will definitely be returning. Thanks Deborah. The cottage was up quite a steep hill but well worth it because the view over the lake was amazing. Everything we needed was there and the property was modern inside and extremely clean and tidy. The owner was very friendly and helpful and easy to contact. We walked to 2 restaurants nearby which were good and also the Osteria in the town which was excellent. We spent a very enjoyable and relaxing 2 weeks in this location, exploring the lake and villas around it. Thank you very much! I am happy you enjoyed your stay at our cottage and Menaggio! The cottage was quite spacious, perfect size for a couple, with a great view overlooking Lago di Como. The terrace was large enough to enjoy the fantastic weather comfortably and the parking arrangements gave us easy access into Menaggio. The walk into Menaggio was a very steep descent but great for a bit of a work out (and to counterbalance the fabulous gelato from the gelateries in Menaggio!). The drive immediately to and from the cottage was surprisingly steep but no problem once we got used to it. The cottage is beautifully built and has a feel of old Italian charm with a modern twist. Deborah was really helpful and friendly, as was everyone we came across in Menaggio. There is loads to do in the area (we particularly enjoyed taking the ferry across the lake to other villages) but we spent quite a bit of time just relaxing at the cottage, cooking wonderful Italian food and gazing at the fabulous views from the terrace! It was absolutely perfect for our honeymoon and we would go back again in a heartbeat. Lake is 1.5 km away. In Menaggio and surrounding area there are different beaches, also a public beach with sand, one large swimming pool and a small one for kids. Milan Malpensa Airport 80 km, Milan Linate Airport 90km, Bergamo Orio al Serio Airport 1 and a half hour drive, Lugano Agno Airport 45 minutes drive. Ferry and other public boats as well as busses in Menaggio's centre. Train station in Como or in Varenna, on the other side of the lake. Bellagio and Varenna 10-15 minutes by public boat. Village centre 15 minutes walk downhill, a bit more going back! Just few steps from the cottage there is the start point of many walk trails in the wood or along the river Senagra or going up towards the mountains. Changeover Day: Usually Saturday, especially during high season. Please ask for different days. Notes on prices: Prices shown are for the property per week in Euros. All prices include oil and electricity. 100 euro service charge to be paid locally upon arrival: it includes final cleaning, bed linen, bath towels and also tourist tax (Menaggio's municipality). Beach towels are not supplied. 250 euro refundable security deposit payable upon arrival.